Once upon a time, Mark Meer went to Dragon*Con. He’d been going to Dragon*Con every year since 1998, and this 2012 year was no different. Or was it? This time, he had friends in the N7 Elite Costume Group that asked him if he would be willing to march in the Annual Dragon*Con Cosplay Parade as his own character in the Mass Effect series – Commander Shepard himself. Of course he agreed, being the awesome and fun guy he was. Then came a beauty named Rana McAnear. Rana was no ordinary beauty, for you see – Rana was the face model for Mass Effect squadmates Samara and Morinth. Rana was also fun and awesome, having cosplayed as Samara at several conventions already. As it turned out, she was also coming to Dragon*Con, and was going to march in the Cosplay Parade as Samara. Mark and Rana met up at Dragon*Con, with each other and with other Mass Effect cosplayers. Purgatory for ME, Pulse for D*Con. ….and their participation immediately went viral. And Buzzfeed’s reason #15 why Dragon*Con is one big awesomely geeky party! 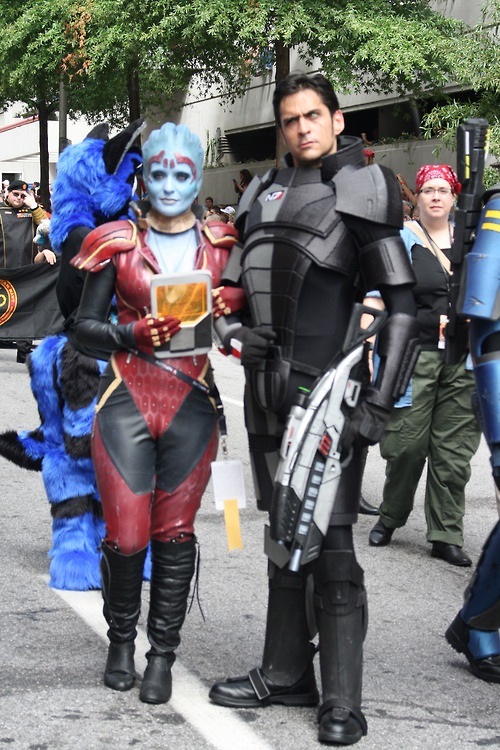 Kotaku‘s Ultimate Proof That Dragon*Con Has The Best Cosplay Ever — Mark as Commander Shepard! 2,000 notes on just this ONE Tumblr post! Over 500 notes on this one from the Parade! And… well… you get the idea. Viral. Then, one day, a man named Steve Mitchell came along and issued a cosplay challenge to Jennifer Hale on Twitter, citing Mark’s Dragon*Con cosplay adventure. (On one tumblr post alone among countless identical posts, over 500 people expressed their adoration for the idea of those amazing actors cosplaying as their characters.) Jennifer heartily accepted the challenge, bringing Ali Hillis into the mix. Raphael Sbarge was also pulled in, who said he would do it if he had the outfit. Karissa and a fellow cosplayer and video game industry employee, Preston, started reaching out to agents, actors, and BioWare to see if this was something that could really be pulled off. Thanks to the support and excitement of agents, actors, and BioWare, the enthusiastic participation of numerous talented costumers, and support of hundreds of fellow fans, the Mass Effect Cast Cosplay Initiative as it is today was born in less than a week following Dragon*Con!